I make my own purity seals because I can't find anyone who makes what I want to put on my models. Whether they be long and flowing or short and stubby. I want them to add to the model and not detract from it. That's the biggest reason to make your own right there... so they match the movement of the model. I'm going to show you a quick way to make your own purity seals in any shape and size you want. You may never buy another one after this. This is an absolutely gorgeous conversion I spotted over at The Heralds of Ruin some time ago. And then I saw the purity seals on the shield. It killed it for me. How I wish those were not there or better yet, they hung down and made the model come to life. 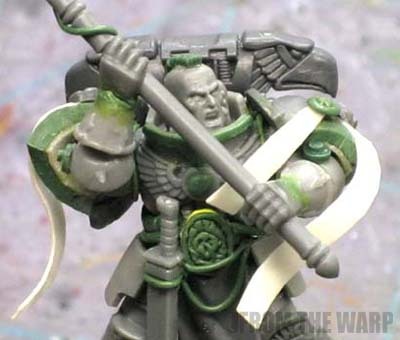 I still love the conversion and I know the amount of work that went into fixing that Finecast model, but unfortunately, the stupid pre-attached purity seals detract from the overall piece. I don't think it's even possible to get all of them off if you wanted to either. But that's my point, use that shield in any other position than upright and the purity seals don't match with what the environment (gravity) tells you and the feeling you're trying to capture. You don't need much to do this. An index card (posterboard would work too), superglue, your X-Acto blade and some greenstuff. I've got a smll piece of tubular stock that is hollow that I use to press down into my purity seal to give it shape as well. You could use just about anything for this from a nail head to the tip of you cutting knife. The first step is cutting out your parchment. You can cut it the length and width you think works best for where it's going on your model. You can make them look like GW purity seals by overlapping two pieces of cardstock of similar lengths and size. 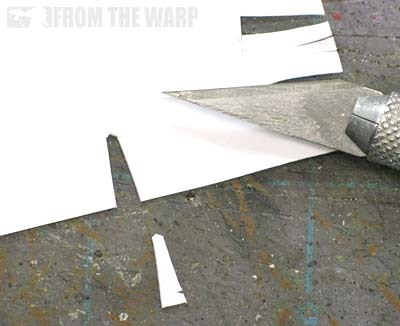 You can add torn bottom edges by cutting up into them and making the bottom edge irregular in shape. You can cut out tiny triangles from the sides to represent tears in the paper as well. Once you have the shape you want, you can bend it to "flow" over the part of the model it will be lying on. It's cardstock and bends easily. The last little trick is to cut the top of the parchment rounded so it blends in with the seal portion once you add that in the end. 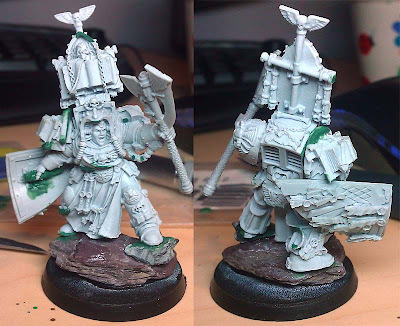 Once you have your parchment ready to go, it's one drop of superglue to attach it to the model (Step 1). Let that dry and you can move onto adding your seal itself. 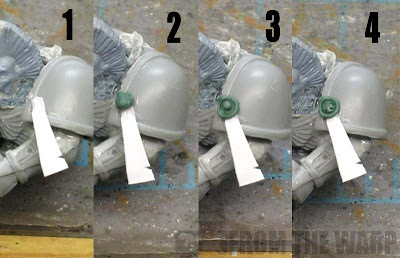 A tiny blob of greenstuff is all you're going to need (Step 2). Set it in place and use your tool or the top of a tiny nail to make a circular indention. Like I mentioned, I have a short piece of hollow tubular stock that works perfect for this (Step 3). The last little bit is making a few tiny marks on the inside of the seal to make look like it has some kind of texture or design on the inside (Step 4). You don't even need to do this step as the clean look works just as well once painted. If you really want to go all out and you want to add some stability to your cardstock purity seal, take a drop or two of superglue (the runny, watery kind is best) and dab it onto the cardstock. It will wick it up and harden like plastic. Now you can make long, flowing purity seals or short ones or tank sized awards or whatever fits on the model you have. You don't have to worry about trying to make something from your bits box "fit" on the model and end up looking too small and pathetic. Great article, thanks for showing my model :-D. Librarian wise, I tried to think of it as if he was spinning REALLY fast :-P. Would have been much better if the bloody things weren't sculpted on! DarthMeer: I love your conversion there. 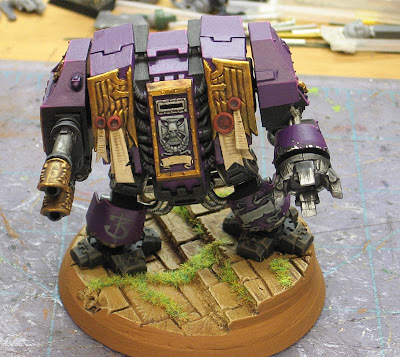 I know the work that goes into that model and you did a great job of making the conversion seamless. It's those stupid seals though. They just go against everything you worked so hard to create. Ron, have you ever tried using brass sheet for seals? I have a sprue from a set of brass etch that is the perfect size, so I cut that to length to use - it seems sturdier than the paper. SpeedyFrenchy: I have not. It sounds like a great idea though. The stability is the important part. this is really clever! I like speedyfrenchy's idea of using brass sheet, too. seems like it'd be easier to keep the bends where you want them. The tubes you get over the end of small paintbrushes work really well for the hollow tube. Grysh: I suspect the brass holds its shape much better than the cardstock would. Ash: What an excellent tip! Thanks for sharing that one. Thanks for another great tutorial, Ron! I agree that making your own seals gives a more dynamic look to models. I haven't used card stock yet for the paper element (must give it a try) but did move from using plain old paper to using Green Stuff, particularly for the longer 'flapping about' seal-papers. It's a bit thick, admittedly, but gave a nice rigidity. Kierdale: Greenstuff works just the same. Roll out a flat section, cut your seal from it, let it cure for a while so you can handle it and then glue it in place. If the process works for you, go with it! Hi Ron, thanks for the article, one question, do you run into any issues spray priming the card stock if the paper isn't treated with glue first? I would have thought it would shrivel up or warp. Chris: Good question, Not at all. I've added them after priming and went straight to painting with a brush and had no issues either.